The U.S. Court of Appeals for the Federal Circuit will hear a case Tuesday, Aug. 11, 2015, involving the U.S. International Trade Commission's decision to block the import of 3D dental images. The U.S. Court of Appeals for the Federal Circuit will decide whether the USITC has the authority to block the imports because of alleged patent infringement by ClearCorrect, a maker of clear braces for teeth. The case, closely watched by the Motion Picture Association of America and several tech trade groups, could lead to dozens of copyright infringement complaints filed at the agency, resulting in the USITC blocking the import of other digital goods. As part of its role, the USITC can block imports of products to protect U.S. companies' intellectual property, including copyright. But before the ClearCorrect case, filed by competitor Align Technology in 2012, the agency has largely focused on patent disputes involving physical products. If the appeals court upholds the USITC's decision, it would give copyright owners backdoor access to the Internet-blocking powers they wanted under the controversial Stop Online Piracy Act [SOPA], the U.S. legislation that failed after massive online protests in 2012, critics have said. The Internet Association and the BSA, two tech trade groups, have raised concerns that the USITC's decision could have negative effects on cloud computing. "If the ruling were to stand, what it would do, ultimately, is open the door to a lot of unpredictable and potentially problematic attempts to use the USITC in ways that it really shouldn't have been used in the first place," said Charles Duan, director of the Patent Reform Project at Public Knowledge, a digital rights group that has criticized the USITC's decision in this case. "We know that there are people who are interested in using this ruling for expanding the commission purview far beyond what it does right now." 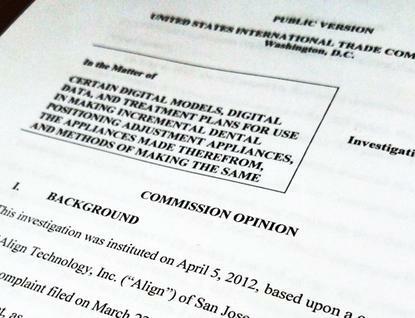 Align has argued that the case is a narrow one, involving only the digital transmission of 3D teeth images. The USITC order, from 2014, requires an affiliated Pakistani company to stop uploading 3D maps of patients' teeth to ClearCorrect's U.S. servers. The appeals court will consider whether the "articles" the USITC can block from import under U.S. law includes digital goods. The USITC, in a June 2014 opinion involving the case, acknowledged its ruling defining "articles" as digital as well as physical was "a difficult question." The commission conducted an "extensive legal analysis" of Align's patent infringement complaint and the USITC continues to believe its decision is "entirely correct," the agency said. The complexity of the case should lead the appeals court to uphold the USITC's decision, the agency argued. "The difficulty of the question presented counsels in favor of judicial deference to an agency's interpretation of its organic statute," the agency's lawyers wrote. The MPAA believes the USITC has "broad authority" to protect U.S. industries from copyright infringement, the trade group said in a statement in April. Limiting the USITC's jurisdiction "will hurt the rapid growth of domestic and international marketplaces for distributing content digitally, and ultimately undermine the commission's mandate to protect American businesses," the group said then. The case has generated comments from both digital rights groups and free-market groups, two constituencies that are not always on the same side on Internet-related issues. There is "absolutely no need to manufacture new agency powers over digital data," free-market groups the Niskanen Center, the R Street Institute(and FreedomWorks wrote in a letter to the USITC this month. "Markets for digital goods have thrived for decades without the commission exercising these powers."